We love Slack, and chances are if you use Slack for your business or organization, then you love it too. Slack is super easy to use, and maybe you’ve already figured out many of its tricks but you could always know more. The Internet-fueled Slack love fest seems to show no signs of stopping. It has transformed how organizations communicate though at its heart it remains a very simple chat client. 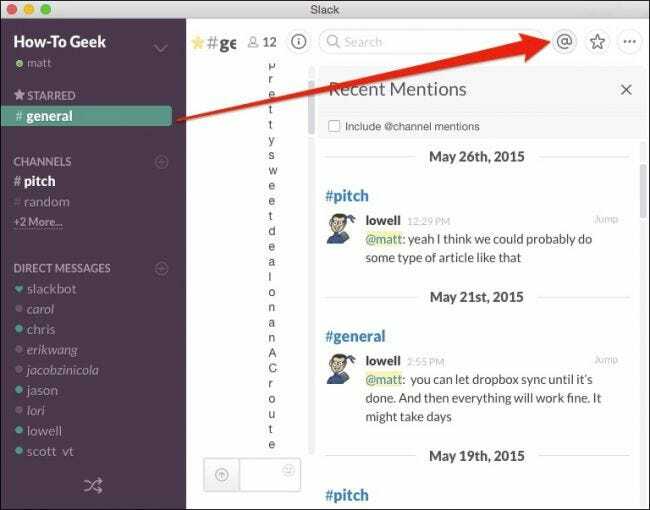 Slack derives its appeal from its friendly appearance, extensibility, and amazing feature set. This doesn’t necessarily mean, however, that everyone is intimately acquainted with everything Slack can do. Truth is, even we aren’t, and so we’re learning new things all the time. To that end, we’ve compiled a short list of some of our favorite tips and time-saving Slack tips. First, your keyboard shortcuts. We are true lovers of keyboard shortcuts around here, so it makes sense that we would be keenly interested in them for Slack. If you use the keyboard shortcut “Command + /” on Mac, or “Control + /” on Windows, it will pull up the keyboard shortcuts screen. 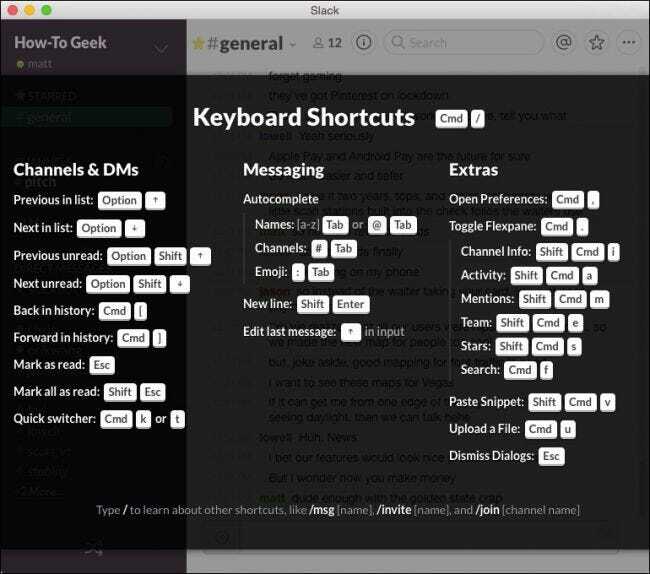 Slack keyboard shortcuts on the Mac app. This is a really important keyboard shortcut to know, but it’s not the only one. To become truly efficient keyboarding your way around the app, spend some time poking around and learn what you can do. 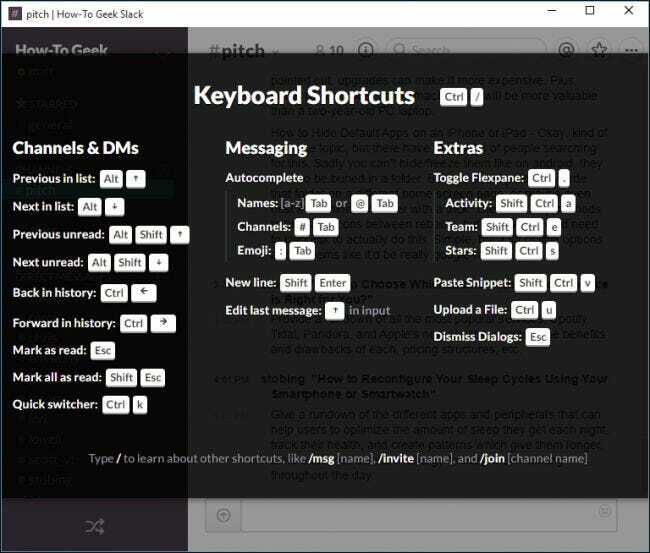 Slack shortcuts on the Windows app. Keep in mind, whatever you learn on OS X will be different than Windows, and vice versa. Still if you’re acquainted with the differences between the two platforms (usually just “Command” versus “Control”), and you use the “/” shortcut to pull up the keyboard page for reference, then you should have no problems. Did someone in your organization say something funny or notable that you want call attention to in your exchanges? 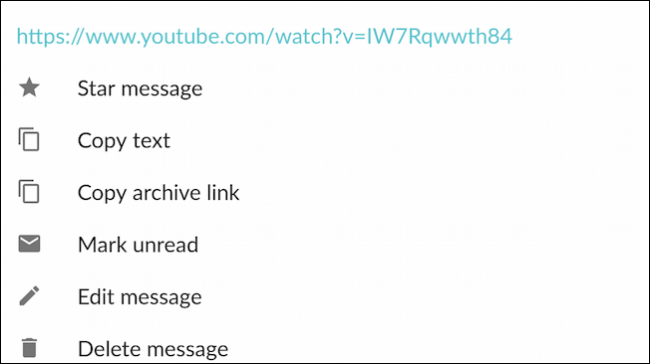 Right-click on a message’s timestamp or long-press on the message in the mobile app, and copy the Slack link. You can then paste it into your chat. This is a great way to draw attention to or cite stuff previously mentioned. Just remember to star any messages you want to refer to because they can quickly become lost in the crush of other chatter. Pointing and clicking is so inefficient when you can simply use “Command + K” (Mac) or “Control + K” (Windows) to effortlessly switch between channels and colleagues. Once you’ve opened the quick switcher, you can type the first few letters of your destination and hit “Enter” to select it. This saves a ton of time over selecting each channel with the mouse. If you hit the “/” key in the compose window, it will bring up a list of commands. You may find many of these particularly useful, such as changing your status to away, opening the preferences, setting reminders, and much more. Think of these as supercharged keyboard shortcuts, just a “/” and quick word and you can make quick work of simple tasks. Speaking of reminders, they’re highly useful if you find yourself caught up in work, and you need to prompt yourself later to do something important. You can use the command “/remind” to have the Slackbot shoot you a message reminding you to message someone, or type an email, or simply to pick up some milk from the store. 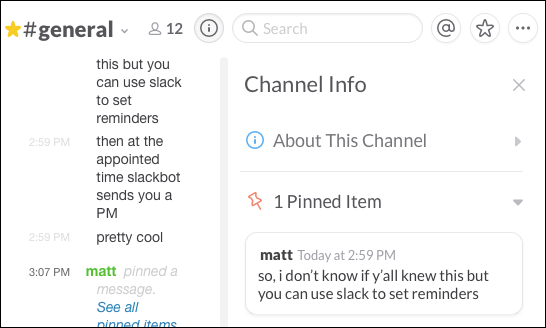 On the appointed time, the Slackbot will shoot you a friendly reminder. So, if you’re running errands or simply overwhelmed with work, then you’ll get a ping just as if someone were sending you direct message. Most Slack users probably know by now that you can edit whatever you type by clicking on the the little gear icon next to your message and selecting “Edit” (or “Delete” if you just want to make it go away). If you want to quickly edit what you just typed, just hit the up arrow. This only works for the most recent message. If you type several more messages in the interim and then notice your mistake, you’ll have to resort to the former method to edit it. Just remember, you will need to long-press on the mobile app to access the edit function, such as here in the Android version. Have an important item you want to make stick.You may have noticed the “Pin to” item in an earlier screenshot. Maybe you’ve some rules you want everyone to be on the same page about, or a daily quote to inspire your team. Regardless, you can pin an item and it will then stay stuck where everyone can see it. Just click the little “i” by the Search feature to see all the pinned items in a channel. You probably don’t want to pin all the things you find notable. For everything else, remember you can use the star system to hold on to useful bits of information that you need to refer back to at a later time. Managing your messages’ read states is a good way to remind you where you left off in a conversation. To essentially mark your place in a conversation, just hold the “Alt” key (any platform) and select where you would like to mark as unread. Anything beyond that point will be considered new messages. On the flip side, if you want to mark a channel as read, hit the “Esc” key. 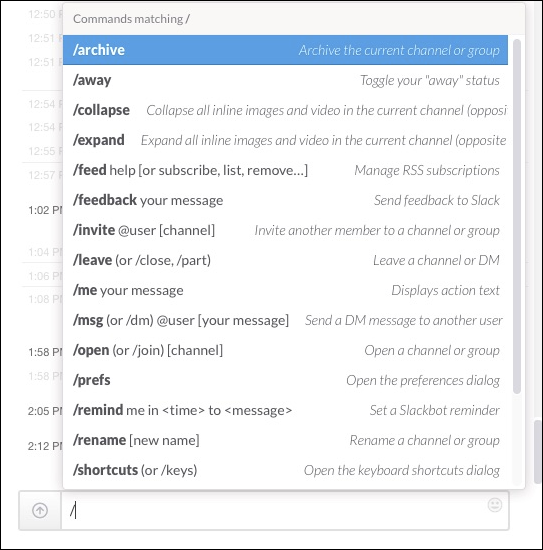 If you want to clear out all your instant messages and new items in every channel, then you can use “Shift + Esc” combination. Slack will pop up with a warning message if you try to do this. You can tell it not to ask you again, so just be careful with this newfound power. 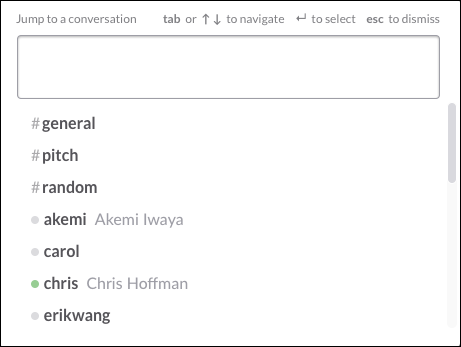 Things can happen quickly on Slack, especially if everyone is feeling chatty. You may end up at some point with several mentions and scrolling back to find out what people have been saying about you may not be so simple. Thankfully, you can check your mentions, which are all compiled in one handy location. In the iOS app, your recent mentions and other important features are accessible by clicking the menu icon in the upper-right corner. In the Slack app for Android, you just tap the “@” symbol on the home screen. Now you will never miss another important discussion wherein you are mentioned. Finally, you can format text, such as if you want to emphasize or draw attention to a certain point. When composing messages in Slack, use asterisks to *bold* items and underscores to _italicize_. There are other things you can do as well, such as making lists. When you use the “Shift + Enter” you create a line break, which means you can number a list or create bullet points. Finally, one other important formatting note is that you can create block quotes using >. Use more to indent multiple paragraphs, as seen in the following screenshot. We know it sounds pretty mundane and you might be thinking “so?” but just being able to do simple little tricks like this can really put you ahead of the rest of the Slackers. If you want to learn more about formatting text in Slack, make sure to check out their help page devoted to the subject. The old adage “communication is key” sounds a little cliche but it’s a simple truth and for How-to Geek at least, Slack has really elevated our daily communications and how we get things done. Then again, there’s always more we can learn to make it better. We hope then that you find these tips essential and they greatly improve how you use Slack in your organization. Of course, there are no doubt other useful things that we didn’t mention. If you would like to suggest your favorite Slack power user tips, please leave your feedback in our discussion forum.